A user could not add an additional printer to SENTINEL, even while following the standard procedure. This article examines the steps taken to resolve the issue and provides a partial solution. It will be updated after further investigation. Target audience for this article: IT/Support Personnel. Click OK to close window and save changes. 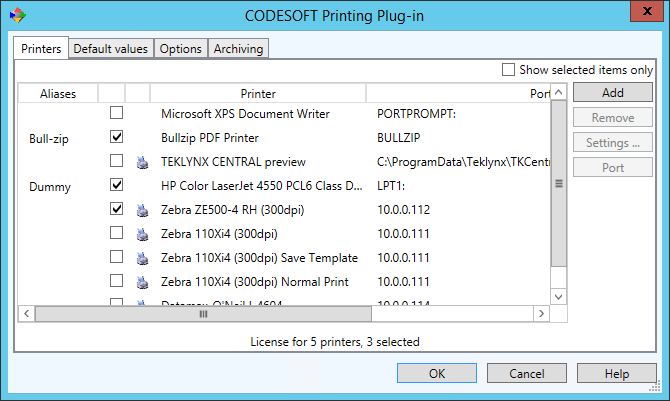 Checkboxes for selected printers were now unchecked. At this time, we have discovered no clear solution to this problem. However, stopping and restarting SENTINEL services appear to have resolved the problem. Restarting the server also fixed the problem. © 2017 Efficient Business Systems, Inc. All rights reserved. Printed in the USA. The information contained in this document is not contractual in nature. It is subject to modification without notice. No part of this document may be copied, reproduced or transmitted by any means whatsoever (unless it is for the purchaser's personal use) without written permission of Efficient Business Systems, Inc.